How much does it cost to travel to Leuven? How much money will you need in Leuven? Additional pricing is in the table below. These average travel prices have been collected from other travelers to help you plan your own travel budget. 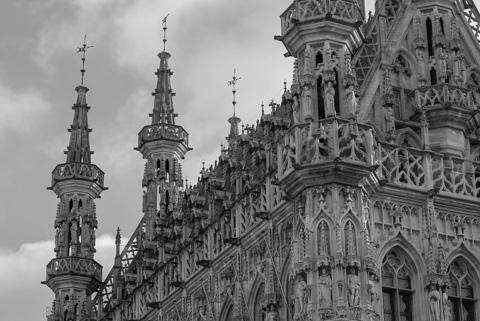 Lying just east of Brussels, Leuven is a Belgian city and capital of the Province of Flemish Brabant known for its breweries, historic architecture, and university. Because of the university, the town is at its busiest during the academic year (September through June), but there is plenty to see and do during all seasons. The Katholieke Universiteit Leuven, abbreviated KU Leuven, is a university that conducts teaching and research in the sciences, engineering, humanities, medicine, law, and social sciences. It is also the oldest Catholic University in the world still in existence, founded in 1425. Although much of the city suffered damage during both World Wars, the historic center has been preserved and buildings like the University Library have since been restored. Leuven also contains two UNESCO World Heritage Sites. One of these sites is the Groot Begijnhof (Grand Beguinage), which includes a completely restored historical quarter south of downtown Leuven. It is also one of the largest remaining beguinages (an architectural complex created to house beguines, or religious women) in the Low Countries. The second UNESCO site is St Peter’s Church, whose belfry is a part of the Belfries of Belgium and France. The University buildings and Leuven&apos;s historic center are also on Belgium’s tentative list to become a World Heritage Sites. Another impressive site is the Leuven Town Hall whose Gothic edifice is decorated with hundreds of statues of local figures, biblical characters, and saints. In Leuven, the best place to start to orient oneself is at the center. Old Market, or Oude Markt, lies in the midst of it all. Not only is the market a pedestrian area, but there are also plenty of restaurants and cafes to indulge in. The Grote Markt (Grand Place) is where the tourist information desk is situated. Also in this central location is a 15th-century town hall with its iconic tall spires, across from which sits the late Gothic St. Peter&apos;s Church. The university lies just southeast of here, making it very easy for students to frequent the city center. Whether explored on one&apos;s own or via guided tour, Leuven&apos;s historical landmarks and architecture are worth visiting. Most are located within the city&apos;s historical center. For those who enjoy art museums, Leuven is also home to the M-Museum, which exhibits a combination of modern art and work from the past centuries. Since the city is also known for its breweries, you may also want to experience the beer-drinking scene. Inbev’s main Belgian beer factory is located in Leuven, producing famous brands such as Stella Artois, Vieux Temps, and Leffe Radieuse. Depending on the day of the week there are also various markets, as well as seasonal markets like the Christmas Market where visitors can shop for Christmas gifts, taste local specialties, and drink a glass of Gluhwein or brandy. Various events and festivals are held year-round. Most people think of Belgium food specialties and they think chocolate, waffles, and beer. Inventors of the chocolate bar and the praline, the Belgian chocolate industry indeed has produced some of the highest quality chocolate since the 17th century. Waffles are, of course, a common street snack and dessert, while beer is produced in a range of more than 1,000 varieties-each matched with a different food dish. Some meals even use beer as an ingredient, such as carbonade which consists of a stew of beef cooked in beer, similar to boeuf bourguignon. Fries are also extremely popular, as they most likely originated in Belgium. They are usually served with sauces, most often mayonnaise or ketchup. Other common dishes include moules-frites (mussels with fries), steak-frites (steak with fries), waterzooi (a rich stew of chicken or fish, vegetables, cream, and eggs), and boudin (a kind of sausage). In Leuven most restaurants are tasty and affordable due to the student population. Muntstraat has a variety of options from traditional Belgian to international restaurants like Chinese, Mexican, or Italian. Other great waypoints for dining include Grand Place, Oude Markt (Old Market), and Parijsstraat. The nearest major airport is Brussels Airport, which has international flights serving Europe, America, Africa, and Asia. A train and a bus station are located right at the airport with trains to Leuven running every half hour on weekdays and every hour on the weekend. Taxis are also available. It takes about 20 minutes by car and 13 minutes by train to reach Leuven from the airport. Leuven&apos;s busy railway station is also connected to multiple locations in Brussels, Mechelen, Lier, Antwerp, Ghent, Bruges, Liege, Mons, the Flemish coast, and many more.